Other posts on cycle route assessment in East Central London enable Amazon-style star assessments. 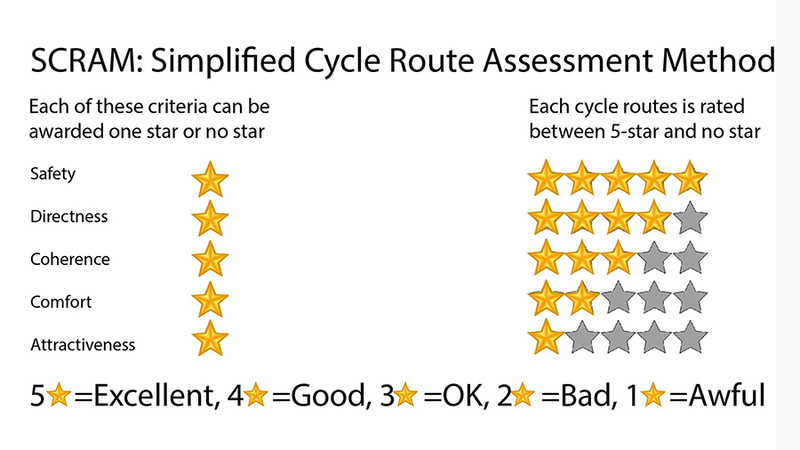 The ratings below can be used for an overall assessment of London’s Cycle Network. This should be done before watching the video or reading the blog post. List of 18 London cycling posts and videos. Until 2015 London’s public authorities got away with murder by providing the most amazing set of rubbishy cycle routes for those who use what is by far the most civilized and sustainable means of land transport ever invented. If you’d like a good laugh about what they did please do a search on Britain’s Worst Cycle Lanes. Scarred by such absurdities, cyclists welcomed the publication of TfL’s London Cycling Design Standards (LCDS) in 2015. It includes the Cycling Level of Service assessment method. Typically, a Level-of-service standard from a public authority is unambitious. It measures the minimum level of a public facility required to meet basic needs. The CLoS Cycling Level of Service Standards rest on six ‘core design outcomes’ which are then translated into ‘indicators’ and said to be drawn from ‘international best practice’. They are in fact a watered-down version of the standards from the Netherlands 2007 Design manual for bicycle traffic published by CROW – a public works research institute. ‘Directness’ is a good example of the dilution. Using the TfL assessment method, a route can get full marks if it deviates ‘only’ 20% from ‘the nearest main road alternative’. The CROW manual is more robust. It categorizes ‘directness’ as a ‘requirement’, rather than a ‘desirable outcome’ and it recognizes, on page 26, ‘that when a journey time by bicycle is longer than by car, this becomes an important reason for using the car and not the bicycle. On the other hand, many motorists appear to be prepared to use the bicycle instead of the car for shorter journeys when it is quicker and more convenient to do so’. Cyclist behaviour in London confirms these facts. Many cyclists, but not all, prefer a faster journey on a main road to a slower journey on an indirect route. They they avoid segregated cycle lanes when sharing space with motor vehicles is quicker. With far too little money invested in cycle infrastructure, not one penny of it should be spent on ‘facilities’ that cyclists refuse to use. The TfL assessment chart awards up to 48 points for Safety and up to 8 points for Directness. There are four problems with this. First safety is not an option. If a cycle route is unsafe, then, as when a drug is unsafe, it should not be advertised to users. It’s true that some pregnant women used Thalidomide without their children getting birth defects. But the drug should never have been marketed. Second, TfL provides no empirical evidence for its weighting system. Why is safety six times as important as directness? Why not three times? Or thirty times? Or a thousand times? Third, TfL state that one of the two main objectives for the Cycling Design Standards is ‘to entice new cyclists onto the network’. Good thing to do. But cycle routes which lack Directness won’t do it – as the CROW manual explicitly states. Fourth, As with all the TfL indicators, safety varies between the sections of each cycle route. Some sections and some junctions are safe. Others are unsafe. So what score should the whole route be given? I suppose it should be segmented and the scores averaged. But with 34 indicators and 100 points to allocate, a Level of Service assessments for a 10 km route would a big task for an amateur, like me. I therefore recommend a Simplified Cycle Route Assessment Method – SCRAM. It is aimed at cyclists and treats routes like consumer durables with Amazon-style star-ratings applied to five separate criteria. Since all of them are important, no weightings are involved. A 5-star cycle route will serve the needs of both commuter cyclists and recreational cyclists. When designed for only one of these groups, as is normal, a route cannot get five stars. If anyone knows of a 5-star cycle route in London, please make a comment below. I think the Embankment section of CS3 gets pretty near it and that a riverside cycle superhighway on the Isle of Dogs would hit the jackpot.